Many things can be said about this. (1) The difference in factor loadings on g across WISC subtests is relatively slight, so the reanalysis does not much affect conclusions about the impact of adoption on intelligence. (2) More importantly, there is no difference at all in average g loadings between the subtests that show a big difference between high- and low-SES adoptive parents and their offspring and those that show little difference. Both loadings are .71 on average. (3) The fact that the subtests that most differentiate between biological parents and their offspring have higher g loadings than the subtests that differentiate least is almost entirely due to the fact that the Coding subtest, which has by far the lowest g loading, is one of the tests that does not differentiate much between high- and low-SES biological parents and their offspring. If Coding is left out, the g loadings for the former average .79 and for the latter average .69 – not much of a difference. (4) The WISC is a heavily verbally oriented test – that is, it measures mostly crystallized intelligence, and the g loadings differ primarily to the extent that they measure verbal ability as opposed to performance or fluid skills. (5) Jensen himself (1998) said that the purest measure of fluid g is the Raven Progressive Matrices test. If we examine fluid g as defined by subtest correlations with the Raven scores, we find that the correlation for biological parents and their offspring flips direction. It is now the test with the highest g loadings that differentiate least between high- and low-SES biological parents and their siblings. So the question as to whether the genetic effect is more reflective of differences in g than the environmental effect is entirely a matter of deciding which is the real g – fluid or crystallized. See Flynn (2000a) for a more detailed explanation of these points in the context of race differences in IQ. More important than any of these points is that the adopted children of upper-middle-class parents did far better in terms of academic achievement than did the adopted children of lower-class parents. The results of their school achievement tests were substantially better and they were far less likely to be put back a grade. And Jensen has in other contexts expressed the view that academic achievement is highly reflective of g. In any case, we care more about school achievement than about IQ. Annoying is the fact that Nisbett does not give us a justifiable reason for excluding the Coding item. As for the other claims he made, it is difficulty for me to make sense of these. But I can say that the last sentence is obviously wrong. Academic achievement is indeed highly reflective of g, but improvement in academic performance does not necessarily imply equivalent increases in g, if g increased at all, insofar as they are not perfectly correlated, and that achievement tests are more malleable than IQ tests. See Murray’s (2005) The Inequality Taboo and Gottfredon’s (2003) Implications of Cognitive Differences for Schooling Within Diverse Societies. Now compare these figures with Jensen’s (1997) table 3. My numbers perfectly match Jensen’s numbers. My result does not appear to be a fluke. But because Nisbett considers the Coding subtest as being the problem, that is, the item to be removed, so then I removed that one and after running once again a PC analysis, I obtain those figures. 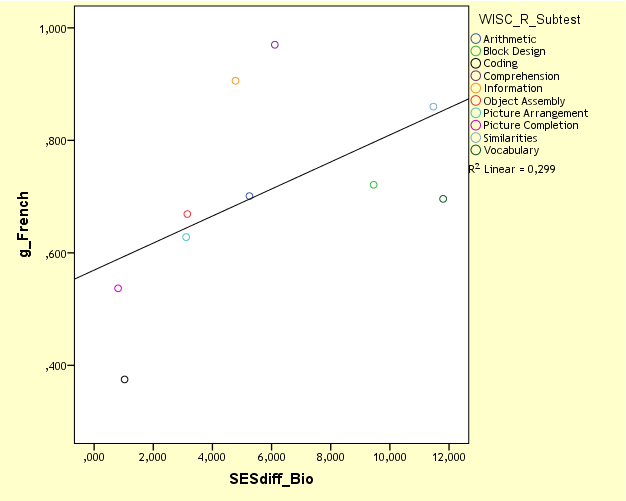 As we see, SESdiff_Adopt loaded equally well on PC1 and PC2, suggesting that IQ gains due to high-SES adopted families could be explained both by variance in g (0.541) and in non-g (0.653). Another difference is that the BW IQ differences now load equally well on PC1 (0.567) and PC2 (0.611). To note, the KMO and Bartlett’s Test shows a value of 0.55, with significance level of 0.164 after removing Coding, while the figures were intially 0.747 with significance level of 0.003. A high coefficient, or value, means that the patterns of correlations are relatively compact and that factor analysis should yield distinct and reliable factors. The congruence coefficients are displayed in my Excel sheet (here). 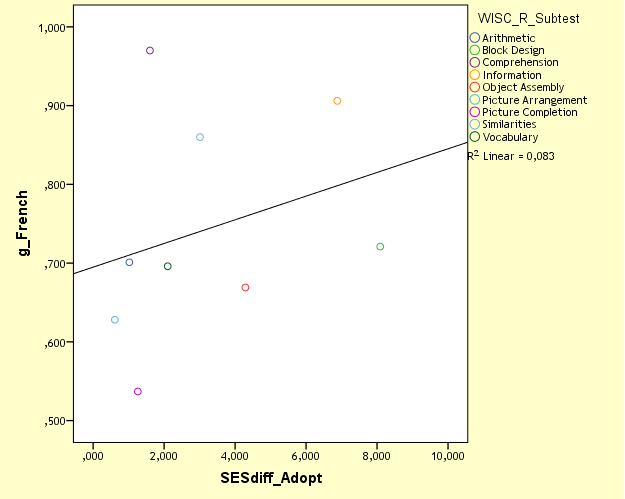 We see that Coding item is somewhat responsible for the absence of correlation between SESdiff_Adopt and g_French. But we also see that the presence of Coding is certainly not the primary responsible for the correlation between SESdiff_Bio and g_French. Either way, the data is not consistent with a purely environmental hypothesis. A last word about the french adoption data. There is another one, which is somewhat popular too. A paper by Duyme et al. (1999, Table 1). This study, of course, is lauded as a proof against the hereditarian hypothesis. 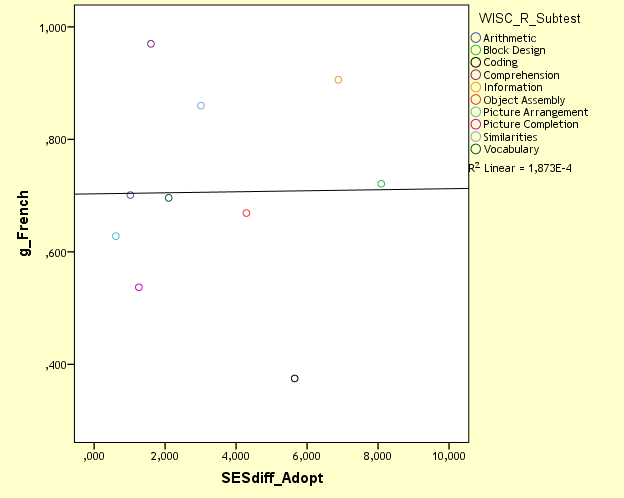 Again, they show substantial IQ gains (WISC-R=58, WAIS=7) in a sample of 65 deprived children, going from 7 to 19 points depending on the adoptive parents’ SES group, with a mean of 14 points. The authors concluded that IQ can be boosted with significant environmental changes. But this is actually a non-sequitur. The IQ correlation before and after adoption is not different from what is shown in the data of children who have not benefited from an improvement in environments. Worse, the IQ correlation is even higher (0.67 against 0.60) which means that there were less IQ changes among the adopted children than among the non-adopted children. The correlation of 0.67 between IQs before and after adoption is moderate and indicates a degree of stability close to the stability found in longitudinal studies of biological children who have not undergone an environmental change (r = 0.60 between 4 and 5 or 14 and 15 years of age) (41, 42). 1. A brief refresher (see Chapter 4): A heritability of 60 percent (a mid-range estimate) says that 40 percent of the observed variation in intelligence would disappear if a magic wand wiped out the differences in those aspects of the environment that bear on intelligence. Given that variance is the standard deviation squared and that the standard deviation of IQ is 15, this means that 40 percent of 15² is due to environmental variation, which is to say that the variance would drop from 225 to 135 and the standard deviation would contract to 11.6 instead of 15 if all the environmental sources of variation disappeared. 86. A twenty-point swing is easily reconciled with a heritability of .6 for IQ. Suppose the high- and low-SES homes in the French studies represent the 90th and 10th centile of environmental quality, as the text says. A twenty-point swing in IQ from the 2d to the 98th centile of environmental quality would then imply that the standard deviation of home environment effects on IQ is 4.69. Squared, this means a variance of 22 attributable to home environment. But as we noted in note 1, a heritability of .6 implies that there is a variance of 225 – 135, or 90, attributable to environmental sources. The French adoption studies, in short, are consistent with the conclusion that about a quarter of environmental variance is the variance across homes (if our guesses about the adopting and biological home environments are not way off). Three-quarters of the environmental influence on intelligence must be uncorrelated with the family SES, according to the present analysis. Note again that the balance tips toward environmental factors outside families as being the more relevant than those provided by families in affecting IQ, as mentioned in Chapter 4. Another recommended reading is Locurto (1990, pp. 287-289). As a whole, anyway, given the small sample sizes of these studies, it should be reckless to jump into quick conclusions. There are a lot more adoption data that need to be analyzed, and that I could have analyzed if researchers dared provide the data (email) instead of just saying “no we can’t” : an answer which I am now used to. What was the final estimate of heredity v. environment in IQ at age 14 in the French adoption study? My vague recollection is something like 58% nature and 42% nurture. Does that make sense? It would be interesting to make up lists of prominent people who were adopted and see if any patterns stand out. One question for nurturists would be: what’s better for children: to be raised by a family like Jobs’ (no big advantages, but had been vetted by an adoption agency to make sure they had no big flaws) or to be raised by a family like Simpson’s (lots of talent, but lots of problems)? You might think that nurturists by now would at least have a hunch on that question, but they don’t seem to have studied it much, or even thought about it. Steve : given H&M discussion on the french adoption data, you can even expect a higher gain to be consistent with a 60/40 heredity v. environment. Andrew : One thing with the idiots who cite small-sample studies as a proof against HH is that they are ignorant with a well-known phenomenon, namely here, sampling error. That’s why you get some erratic studies like Turkheimer (2003) with higher heritability in higher SES families, or Tizard (1972), the last one finds a higher IQ for blacks, lower for mixed race, lowest for whites when those chidren were raised in enriched environment. Of course that one finding has never been replicated. So yes, there are a lot of erratic results when you use small samples. Not surprising would be the fact that adoption data, transracial or not, show a large difference and variation in results given the unrepresentativeness of the sample due to the small sizes. Even more suspicious is the fact that some researchers in their own papers, while they get a sample of say, 300, or even 1000, they say that it is a very large sample. They can even say that 100-150 is a large sample (no, I am not kidding). So, say, you collect opinions of a sample of 1000 subjects. These people are supposed to represent the opinion of the majority, that is, the opinion of millions and millions of people. You think N=1000 is large enough ? Perhaps, but I will respond that even with N of 1000, you can get erratic results. Okay, but the small sample size of the French adoption study was related in part to just how rare it is for children to be adopted across big social chasms, especially from high to low. We should keep an eye out for data sources of similar occurrences. For example, during WWII, some bourgeois Jewish children were adopted by Christian peasants to save them from the Nazis. Lots of resources have been devoted to recounting these stories. It might not be too hard to find out How they turned out? Similarly, I wouldn’t be surprised if there were adoption agencies that generally took in babies from upscale young women, such as, say, Radcliffe coeds. They may have records of interest. n=1000 is way beyond fine. Another set of problems you don’t mention is the combination of small samples, with publication bias, and methodological freedom, and no sharing of data. This combination makes it possible to show pretty much anything to do the case.